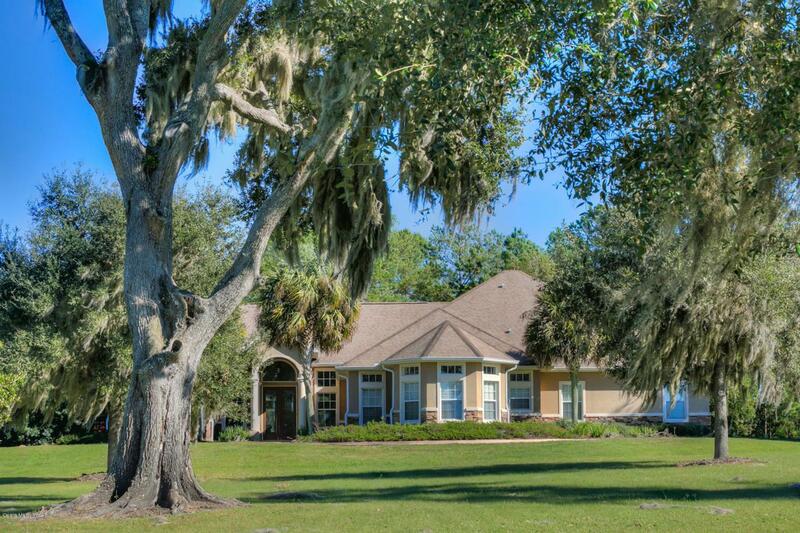 This stunning 25 acre farm located in NW Ocala's magnificent horse country, is beautifully maintained, and is the perfect spot to live your equestrian dream. Enter through the gorgeous gated entrance and wind up the paved drive to the beautiful hilltop home; views from here are incredible. The lush green pastures of this farm include 5 paddocks, all four-board fenced, a well-groomed arena, and a gorgeous center-aisle, 6 stall, block barn with tongue and groove wood ceiling, fly spray system, feed and tack rooms, and wash rack. There are two additional buildings perfect for storage or workshop, as well as a 2 BR/1BA apartment, perfect for guests ranch hand, or for tenant. The gorgeous home provides an open and airy floor plan, and includes large eat-in chef's kitchen, family room anddining area with expanse of windows overlooking pool; the spacious living room includes fireplace and French doors. The master has tons of windows, en suite bath, and French doors to the pool area. The inviting pool area includes a wonderful summer kitchen, and plenty of seating areas, for a variety of spots to kick back and relax. Owner financing available! Listing provided courtesy of Ocala Horse Properties Team of Ocala Horse Properties, Llc.